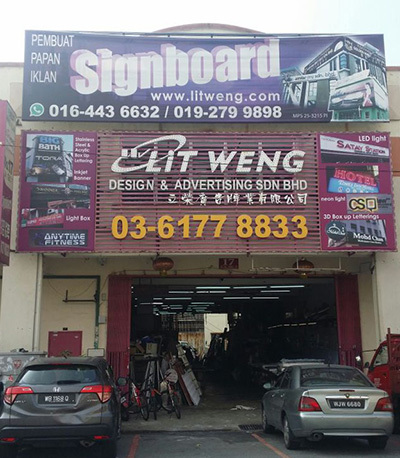 Lit Weng Design & Advertising Sdn Bhd (formally known as Lit Weng Design & Advertising), which is a full service signage company. Providing customers across Malaysia with best quality products and customer services. Experienced, talented & dedicated team of graphic artists, and expert craftsman await your needs. With over 18 years of signage making experience, our abilities to understand your needs and deliver exactly what you're looking for is what sets us apart. Lit Weng Design & Advertising is fully owned by Mr. Hon Lit Yoong & Ms. Tan Kooi Hong as the owner and also the highly enthusiastic directors with a complete business networking to improvise corporate function. Our facilities are able to print for large or small or even more on specific size of signage. We are capable to produce any specific size of the banner for indoor & outdoor. We able to provide professional advice in design and build of the internal and external signage system. 17, Jalan SBC 7, Taman Sri Batu Caves, 68100 Batu Caves, Selangor, Malaysia.